Well, talk about not giving up! Mondays are usually me trying to catch up from the weekend with laundry, grocery shopping, and other domestic engineering duties. At times I look forward to them as much as someone looks forward to a root canal, but today was pretty awesome because I GOT CAUGHT!! My first task for the day was to replenish the pantry and so off to Wally World I went. I found a descent parking spot for a Monday and once again scoped out the parking lot. It was quite busy as many seemed to be thinking along the same lines as myself to get in and out early. I watched a woman in an exercising outfit get out of her car with a cigarette out of her mouth and blow smoke into the wind. I heard an ever so quiet whisper of “that one.” So, without any hesitation, I grabbed my purse, my 3 year old, along with the index card for that day and headed for her car. 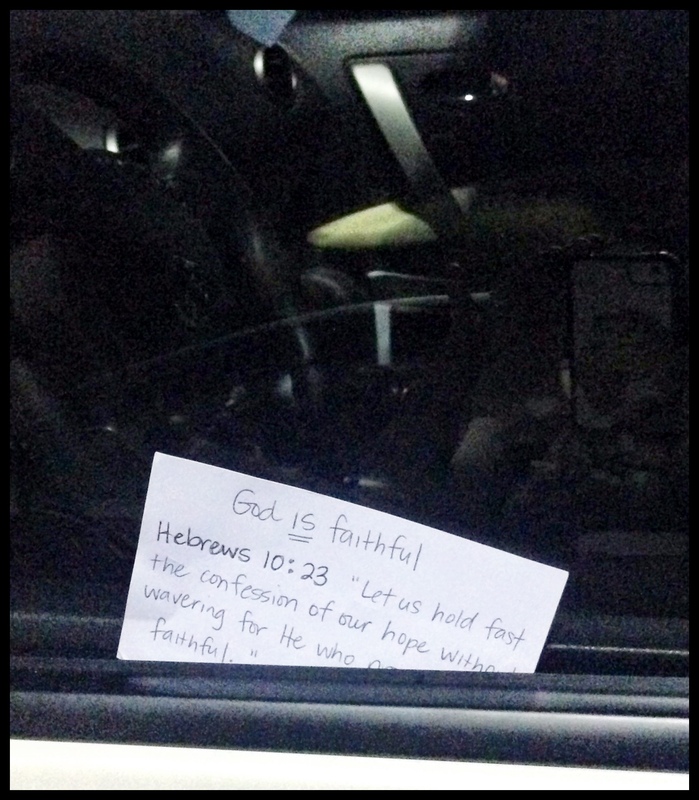 As I tried to place the index card in between her window, the index card bent and I couldn’t find that spot that most cars have to be able to place paper between. All of a sudden a woman came up behind me and said “How about try this” and she took the index card and tried to help me. 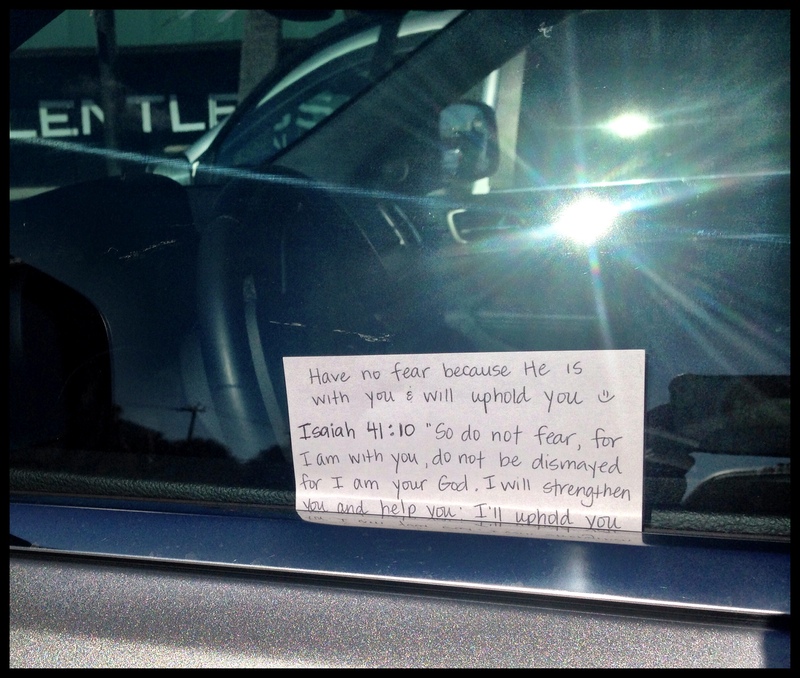 I was at first, startled and then just shocked that someone was stopping to help me leave a note on someone’s car. Her method worked and I thanked her. She accepted my gratefulness and went on her way. Something just kinda took over inside of me and I yelled out at her to get her attention and asked her if I could take her picture and began explaining what the note was all about. She looked at me, smiling and was in agreement….”a person of peace”, I thought! A person of peace, indeed, just as I was taught in Cape Verde! My heart was so full and I was shocked at myself in the fact that I was so vocal about what I was doing, unashamed at what He was calling me to do on this local mission field. After doing this challenge for almost 10 days, it was incredibly encouraging to find a person of peace. I found myself singing a little louder in the aisles of Wally World and intentionally looking directly in the eyes of those I past, making sure they saw the big smile on my face 🙂 Mondays are not so bad as they seem…a little encouragement, persons of peace, and grocery shopping all rolled into one. Yes, I think I can handle that! Well, due to not quite feeling well, I had to take a break for a couple of days on this challenge, but glory be to God, after prayer and resting, I am much better and pressing forward with what He has called me to. 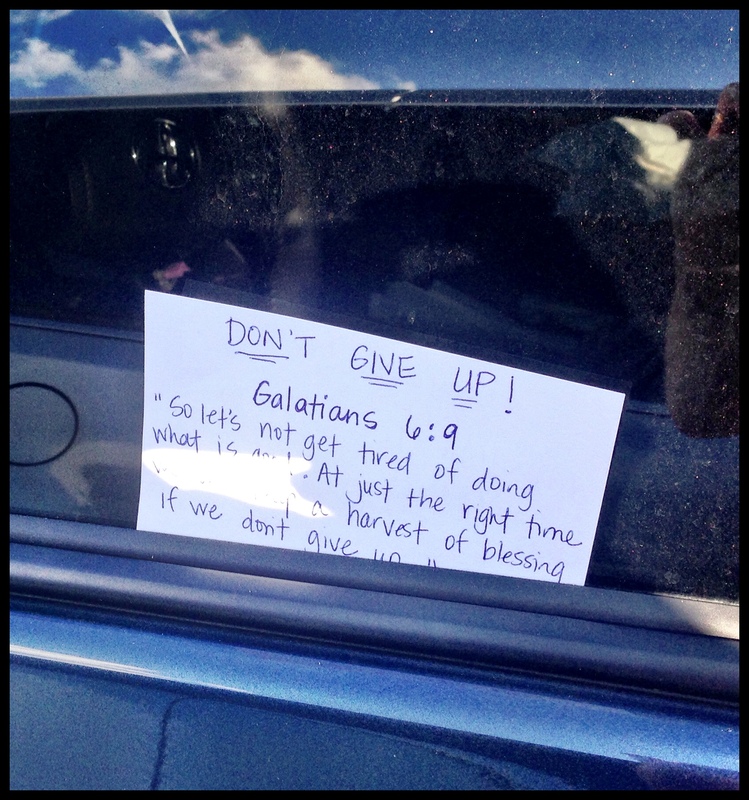 Even with not feeling so well, I was able to leave an index card when I picked up my kids from school on Friday. As I laid in bed and prayed, a thought came to my mind of how I was going to be able to go through with the challenge on that day. When I realized there was no l way I would be able to write about it, I set my mind that I would at least leave the index card with someone and just write about it later. Having to get out of bed to get my kids from school was the only challenge I could have handled that day. As I drove to pick them up all I could think about was how bad I felt and how I couldn’t wait to get back in bed. I am not sure how or even why my thoughts got re-directed, but I began to think how much worse someone else has it. I passed an oncology office on my way to my kid’s school and my thoughts rested on what my stepdad went through in the last part of his life. I remember watching him after his treatments and not being able to even visit him because of all the morphine in his system due to all of the pain he was in. I remember watching him take his last breath on this earth….no matter how bad I was feeling it was quickly pushed aside and I had made up my mind on where I was going to leave this next index card. With the kids in tow, I went straight to the parking lot of that oncology office and parked. Quickly prayed as the kids were not being as cooperative as I had liked and I was concerned my stomach wasn’t going to quite hold up to its’ part of the bargain of staying put for the car ride. I slowly got out of the van, and placed the card on the window, jumped back in the van and got back home. You know, the sufferings we face in this life are nothing compared to what those will suffer in eternity without Christ. We are given an incredible opportunity everyday to be an encouragement and share the love of Christ to those placed in our path. I pray we don’t miss out on them, even in our own sufferings. I had a sister-in-Christ pass away recently from cancer and she used every opportunity she was given to share the gospel, even led her home nurse to Christ in her final days on earth. Even in her suffering, from this fatal form of cancer, she was giving it all for the cause of Christ. I can only hope and pray I am that strong and brave for the cause of Christ as she was in her final hour. I love it when I have a day that goes just so smoothly, my kids are listening and being kind and considerate to one another, all traffic lights are in my favor, lost people don’t seem so lost, no issues at the restaurant, my home magically gets cleaned as I listen to praise and worship music, and all just seems well with the world….today was not one of those days. It seems the more days I am in this challenge, it really is becoming quite the challenge. If it isn’t an issue with timing, or tag along kids, it is a heart and attitude issue with myself. So, with as trying as this day was, I found myself not even in the right frame of mind and heart to even go forth with day seven. Luckily for me, His grace is sufficient and His power is made perfect in my weakness! I know we sometimes throw these scriptures around like they are no big deal, but as I have been meditating on them and putting them to memory, I have found they really have such incredible power. They are active, living, and can judge the attitude of the heart and thankfully change the attitude of the heart as well. With those thoughts in mind, it didn’t take long for me to align my heart and mind to this challenge and complete the task for which He has called me to that day. I became aware of an older SUV that had its’ driver side window down. 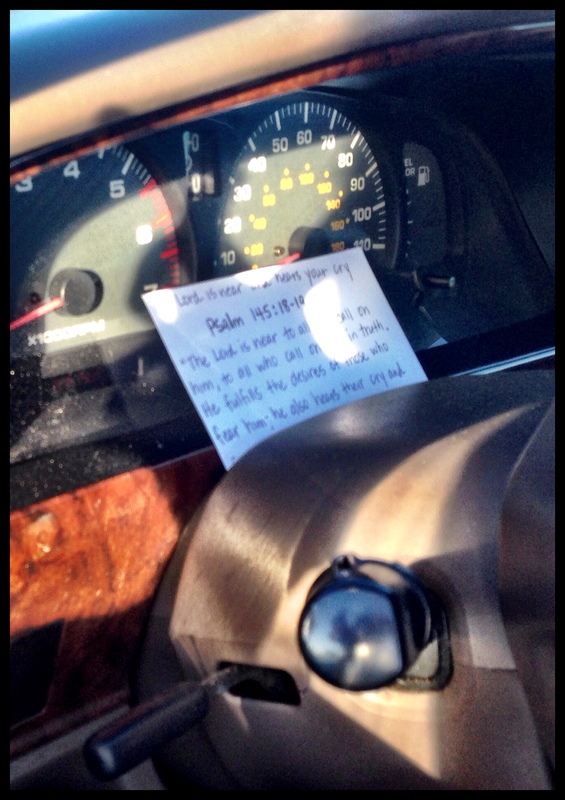 As usual, I glanced around to check to make sure not too many people were paying attention, got out of my van and nonchalantly placed the index card on the speedometer. Another thing I am realizing in this challenge is obedience has a lot more to do with the attitude of the heart than it does than just physically going through the motions. Judas was obedient, but the attitude of his heart was no more joyful or selfless in desiring to obey Jesus than those that just go through the motions on Sunday morning. In over 2000 years, following Jesus has never been about a “going through the motions kind of obedience”, but a “He has captured your heart, kind of reckless abandonment obedience.” Which one do you have? Well, day 5 and I realize to some this challenge is really no big deal. 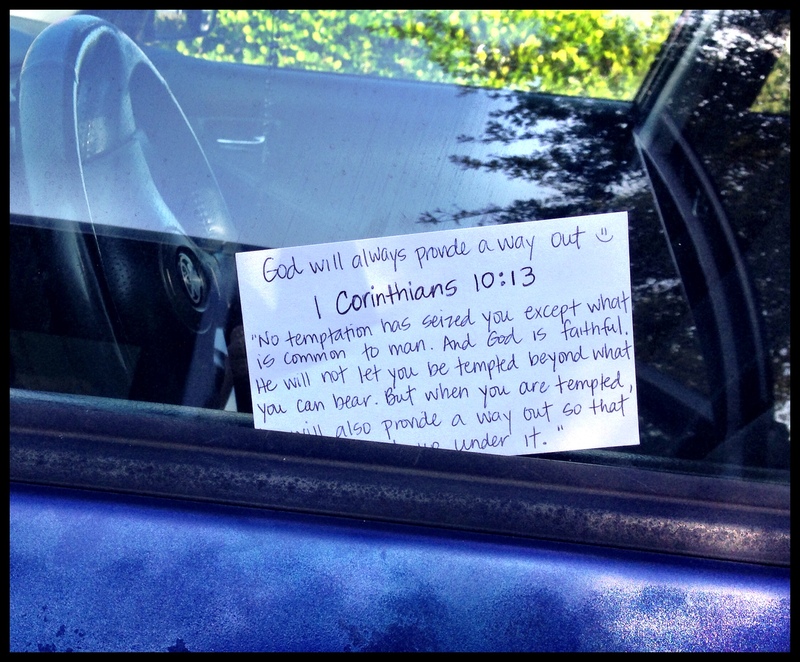 I mean, whoop tee doo, so I write verses on index cards with a phrase from the scripture and leave it on car windows….some challenge. Easy for someone like me, who has supposedly been called as a missionary to preach the gospel to those who have never heard…wrong! Its easy for someone like me who is completely and utterly bankrupt without the love of Christ, who has experienced a grace and love that has captured my heart and life in such a way that I will never be the same and can not be silent knowing the kind of life I live can be lived by others…and so on day five, I press on…. I had to work today so my husband could get to a doctors appointment. Our restaurant is in a strip mall accompanied by the Dollar Store, Planet Fitness along with other stores catered to our community’s needs. 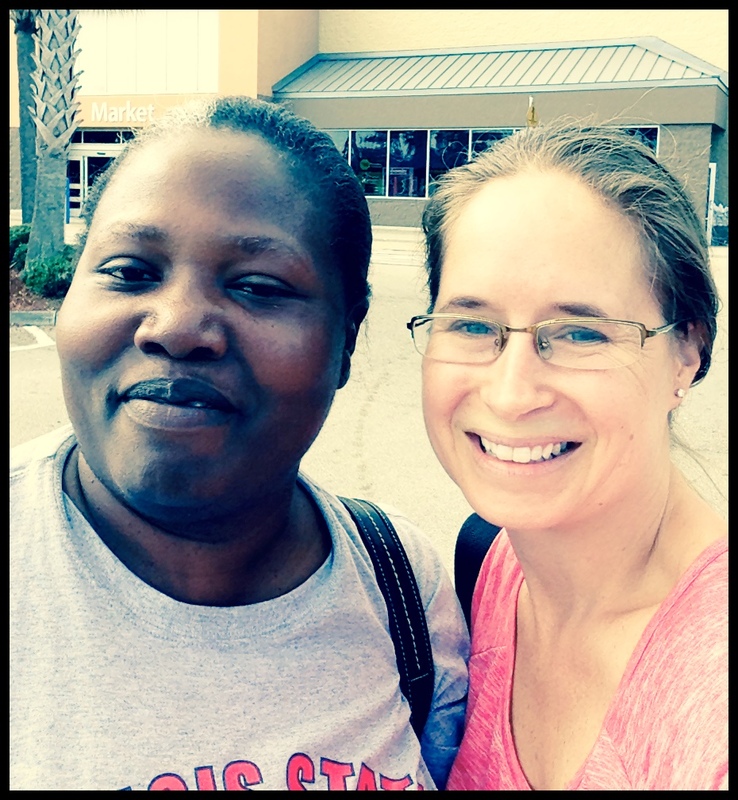 Before I headed to the back of the strip mall to park, I was already aware the Lord wanted me leave an index card with someone before work so I slowly approached the Dollar Store’s parking lot, parked and began to pray. I only had three index cards with me today and as I looked at each one, I was reminded immediately of a post by a friend of mine wrote that morning on Facebook that said “There are about 5,000 gods worshipped by humanity, Jesus is the simplest, most powerful and only true God.” I knew then, that seeing that before I left for work wasn’t a coincidence. 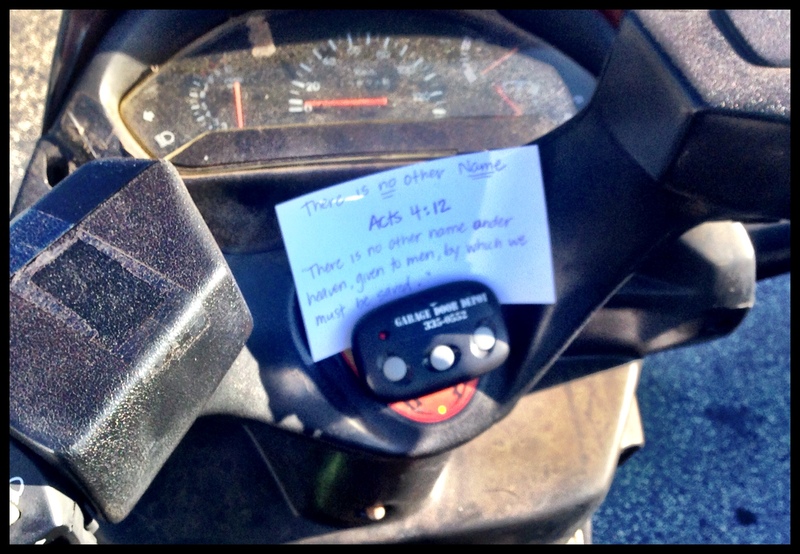 See, the index card I kept struggling to leave was Acts 4:12 “Salvation is found in no one else. There is no other name under heaven, given to men, by which we must be saved.” On the very top of this index card, I wrote “There is no other Name.” I have no problem voicing that to anyone who asks, but most the time when I am voicing that statement, it is to people who know the work Jerry and I do in Cape Verde or it is 6000 miles away on foreign soil, testifying to someone face to face of who this amazing Savior is, not to a complete stranger who may or may not have preconceptions of who Jesus is…leaving this verse was a struggle for me and I know if I didn’t leave it, I was being disobedient. Please let me be clear, it wasn’t a struggle because I don’t believe there is no other name under heaven by which men can be saved, but because it is a very strong statement for the kind culture we live in and I have no idea the impact leaving that kind of scripture would have on someone in this culture. I am grateful, though, for Isaiah 55:11 that reminds me in my doubting that God’s Word does not return empty, but goes out and achieves the purposes for which it was sent! So, after I prayed, I looked up and my eyes fell upon this scooter. It was dusty, and looked like it had a lot of miles on it. I thought to myself that there was no way I could leave one on there, I would be right in the open, right where everyone could see…fear began to creep in and my heart rate increased a bit. Again, a scripture came to mind…about denying me before men and I will deny you before my Father. I pushed that fear aside and set my heart on what He has called me to do. I am realizing this challenge has much to do with chiseling more things out of my life that is hindering the purposes He has for me, allowing me to confront fears, doubts, and insecurities each day that He brings me to leaving these scriptures with strangers. I can only hope I am aware and discerning enough to pick up on which things He wants to chisel off. The more I go through with this challenge, the more He reveals to me just how many are hurting and how many are lost in this world. I am reminded how lost I once was, the person I once was, the person I am now, and the person I am becoming due to His grace and the incredibly abundant life I get to live in Christ. It is this abundant life that leads me to encouraging others in anyway the Lord guides me. On this third day of the challenge I had time before church to treat my kids to Dunkin Donuts. When I entered the parking lot it was bustling with traffic as many trying to get their caffeine fix for the day. The positioning of the parking lot could be clearly seen from the windows of DD, so I made a mental note not to leave a note in that area of the parking lot when leaving, but ask God for guidance of another area He would prefer me to go in. As we left I began looking at the vastness of the parking lot and noticed a “loner” kind of car parked under the shade of a tree. My kids kept asking why I was going so slow and questioning my direction. This was a little different from the other two days, since I wasn’t concerned with having to answer to anyone of what I was doing and why I was doing it. Side note here for those who don’t have children: Children want to know everything you are doing and why you are doing it even if it doesn’t pertain to anything they are doing, their needs, or wants…they just have to know or they’ll explode with the thoughts of not knowing! 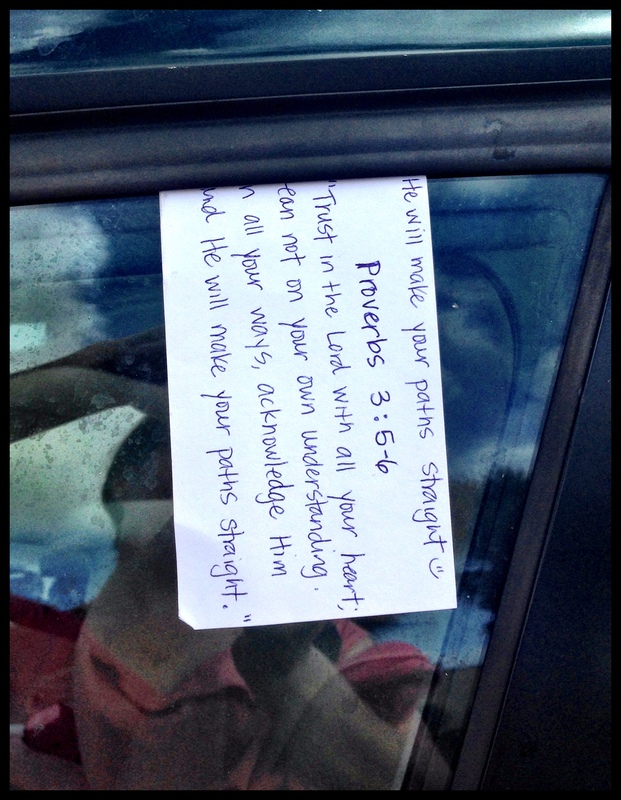 So, after I quickly explained what I was doing to my children, I parked next to this car and silently prayed for the person who would receive this next card, got out of the van, and stuck it in between the car window.